New Society Publishers, 9780865717756, 352pp. Joanna Macy is a scholar, eco-philosopher, teacher, activist, and author of twelve previous books including Coming Back to Life . Molly Young Brow n is a teacher, trainer, counselor, and author of four previous books on psychology and Earth-based spirituality. Joanna Macy , eco-philosopher, activist, and scholar of Buddhism and systems theory has an international following, thanks to 30 years in movements for global justice and ecological sanity. She is the author of 12 books including the original Coming Back to Life and Widening Circles , and she has produced a 2-DVD set entitled The Work that Reconnects . Molly Young Brown combines the Work That Reconnects, ecopsychology, and psychosynthesis in her work: teaching online courses, writing and publishing books and essays, coaching and mentoring, and giving talks and workshops internationally. 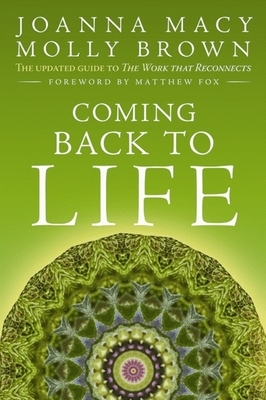 Her five books include the original Coming Back to Life and Growing Whole: Self-realization for the Great Turning .